Engineers inspect the Helios 2 spacecraft. The problem with studying the solar wind from Earth is distance. In the time it takes the solar wind to race across the 93 million miles between us and the Sun, important clues to the wind’s origins — like temperature and density — fade. “You’re constantly asking yourself, ‘How much of what I’m seeing here is because of evolution over four days in transit, and how much came straight from the Sun?’” said solar scientist Nicholeen Viall, who advised Di Matteo during his research at NASA’s Goddard Space Flight Center in Greenbelt, Maryland. Helios data — some of which was collected at just one-third the distance between the Sun and Earth — could help them begin to answer these questions. 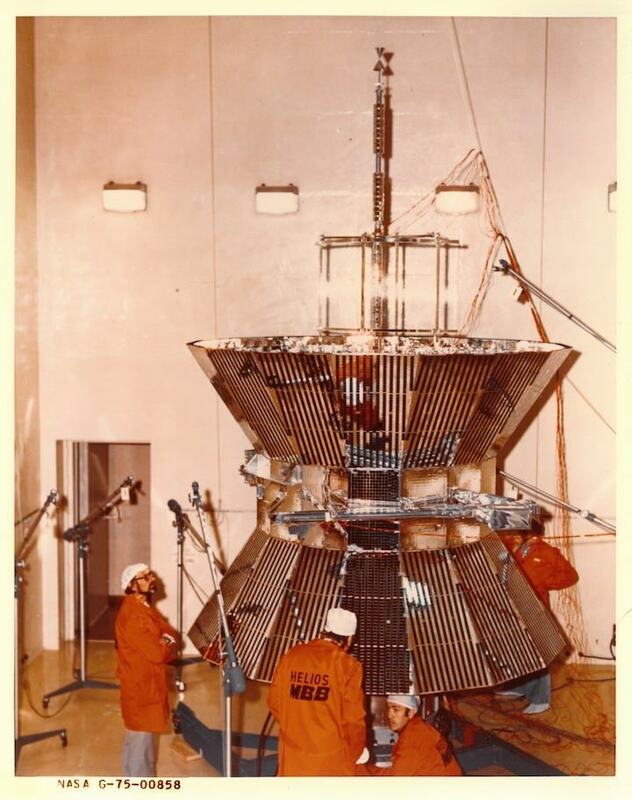 In the days before Parker Solar Probe, the record-breaking spacecraft for speed and closest approach to the Sun were the two Helios probes, launched in the mid-1970s. This visualization shows the orbits of Helios 1 and Helios 2, from an oblique view above the ecliptic plane.